Catherine Elbert has never been good at making decisions, whether it was choosing an ice cream flavor as a small child, or figuring out what she wanted to be when she grew up. The only thing Catherine knew for sure was there had to be more to life than being stuck on her family’s farm in Wisconsin. While watching a PBS travel show, Catherine becomes entranced by Portland, Maine. The ocean. The lobsters. The rugged coast. Nothing could be more different from the flat, nondescript farmlands of Burkesville. Despite her parents threatening to disown her and her brothers taking bets on how many days until she comes home, Catherine settles on Peaks Island, off the coast of Portland. She is finally free. Or so she thought. 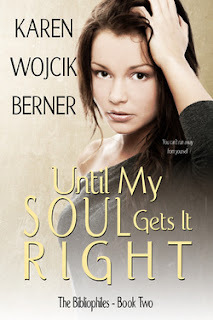 Until My Soul Gets It Right is just as compelling as the first novel of the Bibliophiles series, A Whisper to a Scream! Karen Wojcik focuses on Catherine Elbert this time around and chronicles the different stages of her life before she joins the Classics Book Club, and after as well. The style of this novel was slightly different as it opened almost immediately in Catherine past. This method of telling her story worked for this character, but it gave Until My Soul Gets It Right a disjointed feel in relation to the series as a whole. I appreciated reading the catalysts behind many of Cat's decisions, but I would've wanted to see more of her life after joining the Classics Book Club, which only came significantly into play during the last several chapters. Berner's characters from the first novel, Annie and Sarah, had relatable stories, but Catherine's is one that could catch the attention of a wider audience. After a bittersweet parting from her hometown at a young age, Catherine loses sight of her wants. She has a general idea of how she wants her life to play out, but her travels change her and she struggles to fit in whatever new life she makes. The outcome of Catherine's story is a big difference from that of Annie and Sarah's, and I really appreciate how Berner doesn't allow her stories to follow the exact same pattern. This excellent addition to the series will endear readers to the Bibliophiles indefinitely! Anyone Up for a Book Club? Are you longing to revisit the classics you read back in school? Or, maybe you never read them, opting instead for Cliff’s Notes and now regret your most unfortunate decision? Well, fellow book lovers, now is the time to start your own Classics Book Club, and I am here to help. Each book in my series, The Bibliophiles, will feature two pieces of classic literature that are guaranteed to spark some great conversations. Just follow the steps below, and you will be well on your way. 1. Gather friends who love books and love talking about them. Or just friends who love to talk. Or just friends who like to drink. Either way, it will be a lively book club meeting. 3. Consult the handy party ideas and discussion questions below. 4. Read. Eat. Drink. Discuss. In my latest novel, “Until My Soul Gets It Right (The Bibliophiles: Book Two),” the book club members have just finished reading “The Legend of Sleepy Hollow and Other Tales” by Washington Irving. Here are a few suggestions for your meeting. Sleepy Hollow is a Dutch settlement, so how about Kaasstengels (Dutch cheese stems) with some Erwtensoep (traditional Dutch split pea soup)? Apple and/or pumpkin pie would be lovely for dessert. How about some Advocaat, which is similar to eggnog, to warm up the evening? You can find the recipes at the following sites. 1. Discuss the love triangle between Brom Bones, Katrina Van Tassel and Ichabod Crane. Who do you think Katrina fancies more? 2. The story illustrates the age-old conflict between brains versus brawn. Which do you prefer in a man? 3. How does the actual story differ from the versions you have seen in the movies or on TV? If you are interested in more meeting tips and discussion questions for those classics, please visit the book club suggestions page on my website, www.karenberner.com. Karen has a giveaway for 10 print or ebook copies of the first book in the Bibliophiles series going on that ends OCTOBER 12, 2012: A Whisper to A Scream. Just click on the book title which will take you to her website for more giveaway details! Karen Wojcik Berner lives a provincial life tucked away with her family in the Chicago suburbs. If it was good enough for Jane Austen, right? However, dear Miss Austen had the good fortune of being born amid the glorious English countryside, something Karen unabashedly covets, so much so that she majored in English and communications at Dominican University. Like the magnificent Miss Austen, Karen could not help but write about the Society that surrounds her. A booklover since she could hold one in her chubby little toddler hands, Karen wanted to announce to the world just how much she loves the written word. She considered getting a bibliophile tattoo but instead decided to write about the lives of the members of a suburban Classics Book Club. The series is called, of course, The Bibliophiles. When she isn't reading, writing, or spending her time wishing she was Jane Austen, Karen spends her time can be found sipping tea or wine, whichever is more appropriate that day, and watching Tim Burtonmovies or "Chopped," her favorite foodie TV show.